We've had real winter weather here this year…and we're only half way through the season. There’s certainly been no shortage of snow! Though often associated with sounds like crunching footsteps, roaring snowmobiles, scraping shovels and crashing toboggans, as I stepped outside after a recent storm, I was immediately reminded about just how peaceful it can be when there’s a thick new blanket of the white stuff on the ground. So I poked around the web to see if anyone had studied the sound absorbing properties of snow. Had they? Or course! For example, the National Snow and Ice Data Center states that “snow can affect how sound waves travel, dampening them in some cases, or enhancing them in others.” Not surprisingly, the fresher and fluffier variety tends to absorb sound, while partially melted and refrozen snow reflects more sound. In Snow Cover Effects on Acoustic Pulse Propagation, Donald G. Albert writes that snow is “by far the most absorptive naturally occurring ground cover.” He measured how much pistol shots decay as they travel over snowy terrain in the winter versus bare ground in the summer. Apparently snow results in lower peak sound levels and noise that is one tenth as strong when measured at 100 m (109 yards). Researchers have also studied snow to see if it can lead to improved designs for manufactured absorptive materials. For instance, in Sound Absorption of Snow, Maysenhölder et al. investigated whether the absorption of snow depends on its structure and porosity. Their measurements of 5 cm (2 inches) of snow show that density impacts how much sound is absorbed, as well as the frequencies absorbed. This thickness of snow is most effective in the range of approximately 800 to 1200 Hz – where it absorbs between 80 and 100 percent of the sound – and quickly drops off both above and below it. And snow doesn't only absorb sound…it can also act as an acoustic barrier as Sakakibara et al. show in their much more somber paper called What Can Avalanche Burials Hear? While less dense snow insulates best against higher frequency sounds, compressed snow (like that following an avalanche) is a much more uniformly effective barrier to sound transmission across the audible frequency range. In fact, at a depth of just 30 cm (12 inches), the drop in volume is 50 dB across a wide frequency range. That’s better than most interior office walls built today. 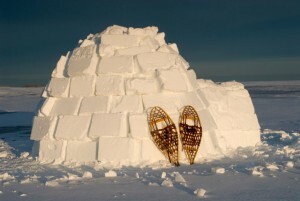 Igloo anyone? They also experimented with the effectiveness of various signals reaching an avalanche victim and found that they were far more likely to hear a rescuer stomping on the snow or sticking it with a ski-pole than one using their voice or a whistle.